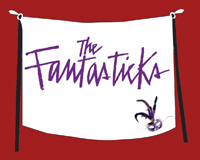 The original off-Broadway production of The Fantasticks ran a total of 42 years and 17,162 performances, making it the world's longest-running musical at the time. It tells an allegorical story, loosely based on the play The Romancers (Les Romanesques) by Edmond Rostand, concerning two neighboring fathers who trick their children, Luisa and Matt, into falling in love by pretending to feud and erecting a wall between their houses. The fathers then hire traveling actors to stage a mock abduction, so that Matt can heroically seem to save Luisa, settling the supposed feud and securing their fathers' blessings (which of course the young lovers have really had all along). The children discover the deception and reject the arranged love match. Each goes off to experience the wider world. They return to each other bruised but enlightened by their journeys, realizing that they have always been in love, and renew their vows with more maturity. Elements of the play are ultimately drawn from the story of Pyramus and Thisbe, its story winding its way through Shakespeare's Romeo and Juliet and A Midsummer Night's Dream as well as Donizetti's L'Elisir d'Amore.